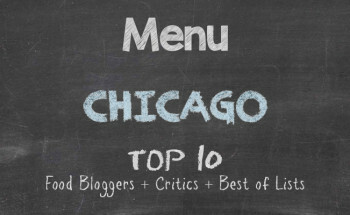 It dawned on me that although I have blogged a lot of restaurants in and around the metropolitan Chicago area, there are more that I have visited and not blogged. I don’t always have my camera with me and because I often leave my cellphone at home intentionally, I then don’t have anything to record spoken annotations of certain dining experiences. Fortunately, there are some restaurants that are still in business and their first visits were so memorable that I have since returned. La Notte Cafe & Bar at 6822 Windsor Avenue in Berwyn, Illinois, is an example of one of those restaurants where I went well over a year ago without a camera for capturing the impressions of all the good food. A great friend and I returned for a second visit. Figuring that there would be a large dining crowd for the fantastic Saturday that it was, we arrive for a 4:00 PM seating. 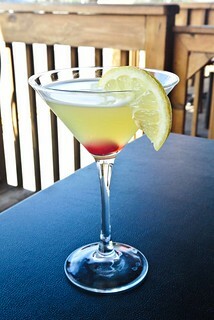 To make things even better, we sat outside on their patio and quenched our thirsts with a nottetini and a sidecar. 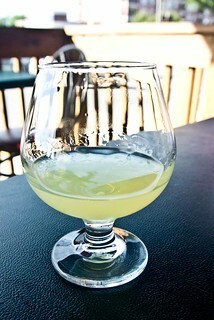 The nottetini was truly a glass of Italy, a mixture of limoncello and vodka. James Bond would enjoy this one without having to mention wanting it shaken instead of stirred. I requested the sidecar with a slight modification. 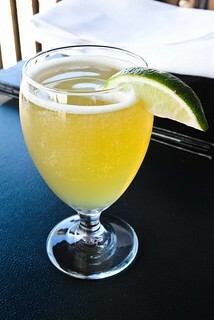 I wanted it mixed with whiskey for the base as opposed to a sour liqueur. Bravo! We were in our usual mode of wanting a degustation. The beauty of going to small and family owned restaurants like La Notte is that you can order accordingly. And the menu may be adjusted to taste or ordering desires. This means nothing is thawed, popped into a microwave or conventional oven, arranged on a plate, and then brought to the table with a declaration of “Voila!” So, in keeping with our degustation, we started with the zuppe del giorno. 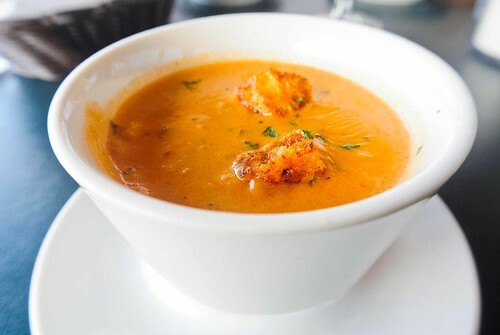 This cup of love had a New England clam chowder base with smoked gouda cheese, shredded tilapia, fresh shrimp, a purée of shiitake mushroom, and finished with shallots, cognac, and a splash of tabasco sauce. Assolutamente deliziosa. A lot of my recent restaurant outings have reintroduced chicken and some beef into my diet. The result of that, and I really shouldn’t put the blame on indulging meat, is that I have gained a few inches in my waistline. That is quite fine, except for me having a hard time zipping and buttoning some tailor-made pants that cost a mint. In addition to my new gym membership, I need to get back to a regimented pescatarian diet. The great thing about La Notte is that the seafood selection is splendid. So, we ordered soft shell crab. 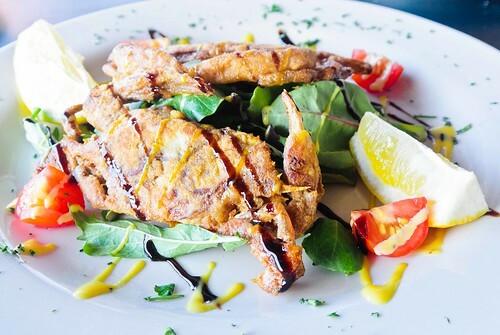 The soft shell crab came with a balsamic glaze and honey mustard over a mixed greens and cherry tomatoes. Very simple, yet savoury. 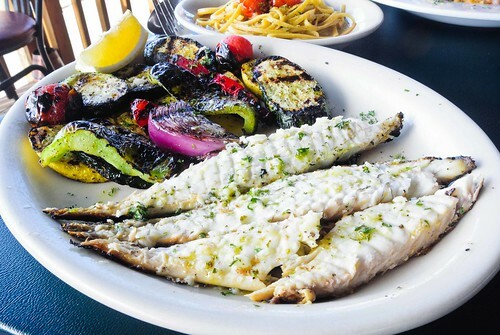 Italian dining does not always have to include pasta. And anyone who has had risotto worth using as a trump card in discussion about who has had the best dish ever will agree that Italian cuisine has some versatility that will make you forget about penne, spaghetti, fettuccine, and angel hair pasta. 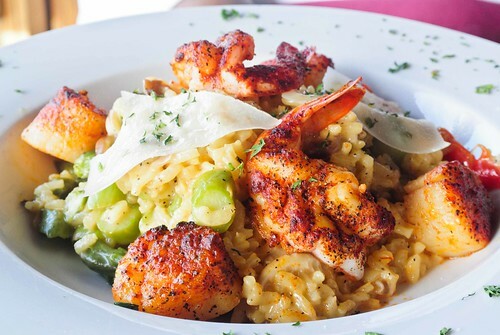 The risotto we ordered came with a cheese base blooming with great taste, giant shrimp, tender scallops, and chopped asparagus. Served family style, the dish was substantial. The chef left disappointment out of the recipe completely. Grazie a dio per questo. With the platter of sea bass and mixed, grill vegetables of squash, zucchini, red onions, bell peppers, and cherry tomatoes, we got a tableside presentation in deboning the bass. Watching the owner work his magic with only a fork and spoon, and then applying a garlic drizzle to the dish, you have to appreciate the art involved in filleting the fish. But the burst of gusto in each bite had me almost forgetting about the side pasta that had come with the dish. And given that there is quite a bit of the sea bass and vegetables, the dish is still light. There exists an atmosphere very much like that of the “old country.” There is no rush. My friend and I sat to let the soup, appetizer, and entrées settle. After some time, we decided that we would indulge dessert, which is another vice that I need to control. We had some homemade limoncello — my friend because she was not driving and me as a disclaimer to null the discomfort from a pulled muscle. The son at La Notte explained that his grandmother sends lemons from Phoenix, Arizona, and that is what they use to make the limoncello. Good on them because it is worthy of savouring from a sniffer. 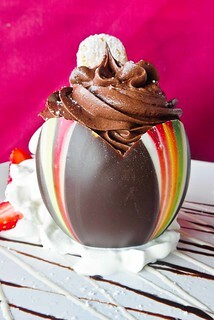 There was a chocolate tulip, filled with chocolate sorbet and topped with chocolate. Be forewarned if you order the tulip, it is rich. 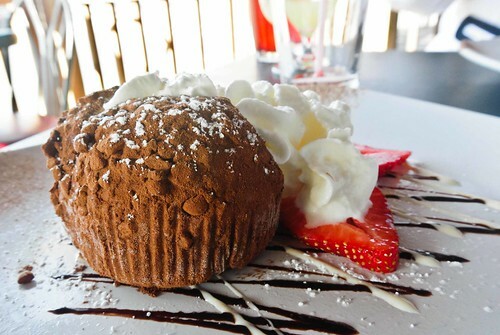 And if the tulip isn’t enough, the tartufo is another option for catering to the monster. A small ball of vanilla ice cream encased in a bigger ball of chocolate ice cream and then dusted with cocoa powder and hazelnuts. Served with strawberries and whipped cream, all you have to do is add the clinking of a spoon on your plate and a scream afterwards. For our finale, my friend had coffee with cream and I had a cappuccino. My indicator for good coffee is when you can take it without any sweeteners. 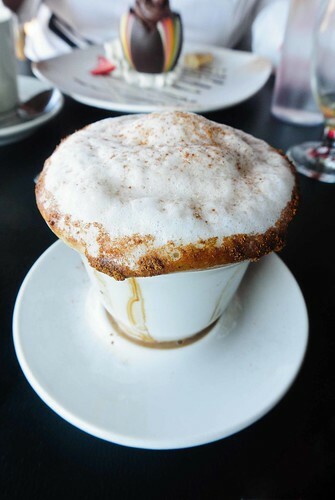 The cappuccino surpassed the test and reminded me of the cups of cappuccino I had during visits to Milan. Berwyn is slowly becoming a nearby Chicago suburb whose focus is primarily on authentic dining. What many will find are family owned and small restaurants that boast dishes that you will indeed find during visits abroad. 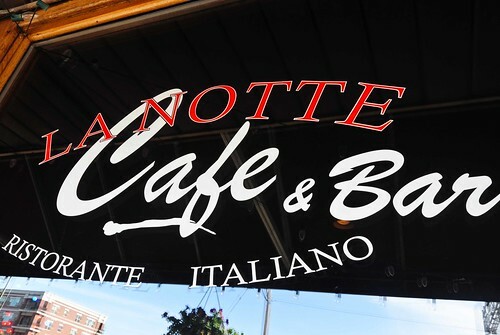 La Notte Cafe & Bar is not simply an establishment borrowing Italian charm. The father and son not only retained the Italian customs in the recipes, but also make sure that the dishes that come to the table reflect the same quality that they enjoy in their own homes. The service during my first visit was well past the high mark of 10. The service during the second visit was even better. For what I would consider fine dining, the prices are extremely reasonable. If you want the feel of going to someone’s home and having a meal without being rushed, I highly recommend La Notte Cafe & Bar. I know it won’t take me a whole year for a return visit.